Centuries after the ancient conquerors had come and gone—their homes and fortresses buried by shifting sands—the tetrapods came to Ashdod. These four-legged concrete monsters, weighing 15 to 25 tons each, were dropped into the sea and piled on top of each other until there were 40,000 of them, enough to form a breakwater. It was the early 1960s, and Israel was building its largest, most modern port, 25 miles southwest of Tel Aviv, in a place that had no natural harbor and almost no city. At the time, Ashdod consisted of a port and a power station and just the beginnings of a city planned as a center of industry and immigration. Despite the competition held for the city’s design, and the winning entry by Heinz Rau, who had also created a master plan for Jerusalem, it would be years before the sand dunes could sprout a real city worthy of a tourist’s visit. Today, dozens of cruise ships each year bring tourists from around the world. The tugboats are still there, guiding the new arrivals to their berths. But the bag-hauling stevedores are gone, their place taken by mega-crane operators. 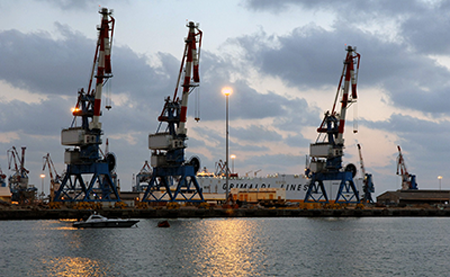 More than one million containers pass through Ashdod’s port each year, their loading and unloading around the clock (except on the Sabbath) managed electronically from a central control room. And 4,000 trucks pass through the port daily, hauling the containers to their destinations in Israel and the Gaza Strip. “It’s a lively city with lots of young people,” said Rabbi Gershon Boterashvili, 45. Boterashvili came to Israel as a child from Soviet Georgia and leads a congregation of 500 families at Or Yitzhak Synagogue in the city center. 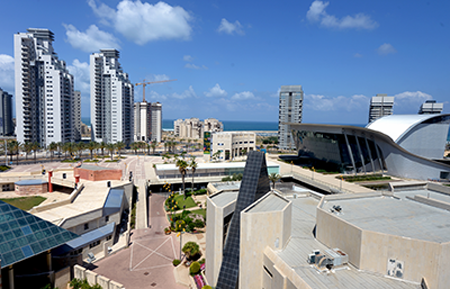 Ashdod, he said, has the advantage of being both a traditional city and one with many opportunities for academic study. The Monart center. Israel Government Press Office/Haim Zach. Ashdod’s population—which stands at 220,000—includes a rich mix of immigrants, one-third of whom are from the former Soviet Union. According to Boterashvili, Ashdod’s Georgian-Jewish community—only one part of the local Russian population—is the largest in the world, numbering 40,000. The city also has a sizable community of Karaites, most hailing from Egypt but some from the Crimean Peninsula as well. (Karaites are Jews who believe they are descendants of the Saducees; they recognize the Hebrew Bible and not the Talmud as their sole authority.) And Ashdod’s Jewry includes immigrants from Morocco, Romania, India, Ethiopia, France and the United States—each group preserving its traditions and culture. 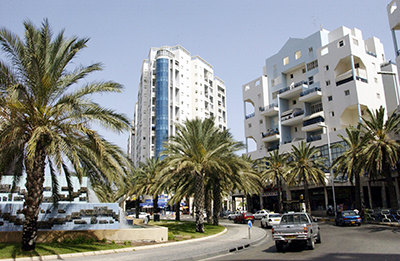 To accommodate its growing population, Ashdod is building up. Twenty-four-story apartment buildings are now a common sight, especially where palm tree-lined Begin Boulevard—the main thoroughfare—reaches the water. To meet a full-size tetrapod, or if you’d like to try your hand at guiding a ship to its berth, head for the Visitors Center at Ashdod Port. Besides interactive games, the center offers an excellent brief film about the port’s history and a guided tour of the actual berths and cranes—a rare opportunity to savor the romance of shipping. Tours in English, for groups only, are free, but must be booked in advance; children must be at least 9 years old. The Lachish River meets the sea in Ashdod after flowing between the port and the city’s industrial zone. It has been rehabilitated and its banks have become a park with a variety of plant life and birds. Enter just south of the port to take a relaxing stroll through the grounds. Overlooking the port and the park entrance is Givat Yonah (Jonah’s hill), which, at 174 feet above sea level, is the highest point in the city. In antiquity, it overlooked the Via Maris, a major trade route stretching from Egypt to Mesopotamia. Ancient tradition suggests that the biblical Jonah was buried here. At the peak is the Ashdod lighthouse, no longer in use. Building boom in Ashdod. Israel Government Press Office. Arie Klang House, a sleek cube with an overhanging roof, adjacent to Givat Yonah, houses the gallery and shop of the local artists’ association (2 Yair Street; 011-972-8-922-1883). Follow the promenade south to La Mamounia, a large Moroccan-style catering hall whose façade, complete with arches and turrets, is reminiscent of the façade of the luxury hotel of the same name in Marrakesh. On Wednesdays, starting from La Mamounia and stretching south, a sprawling, colorful bazaar with dozens of vendors selling everything from cabbage to sneakers draws a mix of residents and visitors. 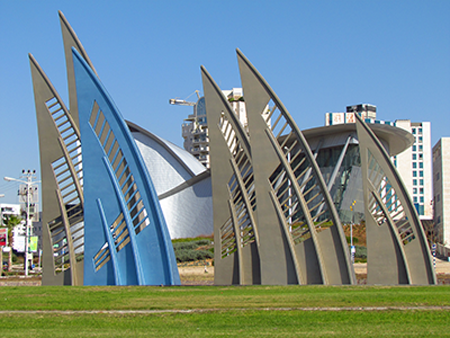 The exterior of the 938-seat Ashdod Performing Arts Center was inspired by seashells, according to the architect, Haim Dotan. The combined offerings appeal to a broad swath of residents and include opera tenors from Moscow, a Soviet Georgian dance theater, popular Greek singers, classical music, cantorial music, an international jazz festival and Israeli theater. A small pyramid graces the entrance of the Ashdod Art Museum, part of the Monart Center for the Arts. The museum tries to display artists who have a thematic or biographical connection to the city, but also shows works by other Israeli and inter-national artists—an approach formulated by the museum’s founding chief curator, Yona Fischer. The rectangular galleries, arranged in a spiral, were inspired by rectangular cargo structures. In addition to galleries, the Monart center houses the Israeli Andalusian Orchestra-Ashdod. Its members—Jews and Arabs, including immigrants from North Africa and the former Soviet Union—perform Sephardic liturgical poems from the Middle Ages and classical Andalusian music. Monart also houses the Panov Ballet Theater, founded by former refusenik Valery Panov, as well as smaller artistic ventures. Just east of the promenade, in a little park at the corner of Mefkura and Moshe Dayan streets, a silver-colored hollow sculpture depicts adults and children “going up” to Israel. Called Shadow and Light, it commemorates the aliyah of the Jews of North Africa and the underground and Mossad operatives in Morocco, Tunisia and Algeria who helped in their rescue. On the park’s northern side, a sculpture showing two ships, one battered and the other sinking, commemorates illegal immigration to Palestine—in particular, two ships carrying Romanian Jews, the Struma and the Mefkura, which sank en route to Palestine during World War II. The Philistines are one of the most misrepresented people in popular imagination, thanks to the biblical depiction of them as a cruel enemy. The Corinne Mamane Museum of Philistine Culture (book English tours in advance) presents a different narrative based on archaeological finds. Visitors to the museum have an opportunity to pretend they are Samson knocking down the temple of Dagon, the Philistine deity. Back on the promenade, an eighth-century CE citadel, built by the Muslim ruler on the site of the ancient city of Ashdod Yam, has eight well-preserved towers, four round and four square. 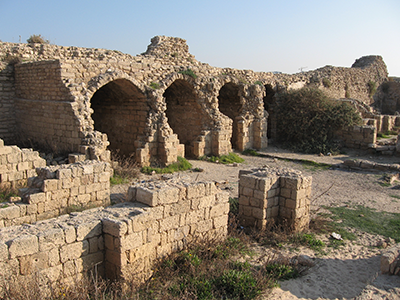 Crusaders took over the citadel in the 11th and 12th centuries, but in the 13th century, the city was abandoned and the drifting sand covered it all, including the citadel. A little further south on the promenade lie two recently uncovered vaulted family tombs from the Roman and Byzantine periods. These were part of the cemetery of ancient Ashdod Yam, which remains buried. Take time off for a leisurely meal at Pescado (011-972-8-852-3063), a kosher fish restaurant with Mediterranean cuisine, on Martin Buber Street near the West Hotel. The whole sea bass is perfectly prepared; pescado a la plancha, a dish combining a white fish and vegetables, is highly spiced. Perhaps the most lavish of Ashdod’s many synagogues is Or Yitzhak (10 Hazionut Street, off Begin Boulevard), one of seven established in the city by immigrants from Soviet Georgia. The eclectic stone-and-glass façade includes tall arched windows and Corinthian columns topped by gilded capitals. Inside, the wooden seats, Ark and central bimah feature intricate carvings with floral motifs, and the floor is ornamented with marble inlay. The members of the city’s only non-Orthodox congregation, Etz Haim, are English speakers who hold Friday night services in the Ha’ogen bomb shelter at the corner of Yitzhak Hanasi and Herzl streets. To visit the synagogue, contact Sarah Levin, recognized as a Notable Resident of Ashdod for her work with Ethiopian immigrants, working women and the elderly (011-972-8-855-7130).